Blues Traveler is an American rock band that formed in Princeton, New Jersey in 1987. The band's music spans a variety of genres, including blues rock, psychedelic rock, folk rock, soul, and Southern rock. They are known for extensive use of segues in live performances, and were considered a key part of the re-emerging jam band scene of the 1990s, spearheading the H.O.R.D.E. touring music festival. 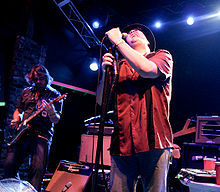 While Blues Traveler is best known among fans for their improvisational live shows, the general public is most familiar with the group from their Top 40 singles "Run-Around", "Hook", and "But Anyway". They gained mainstream popularity after their fourth studio album, four, released in 1994 and became a sleeper hit almost a year later. Sheehan's death and Popper's struggle with obesity put a damper on the group's success, and A&M dropped the band in 2002. In the years following, the band has bounced around through a succession of independent labels and record producers, and gotten increasingly experimental with their recorded output. Blues Traveler's latest album, Hurry Up and Hang Around, was released in the fall of 2018. After graduating Princeton High School and moving to New York City, Popper, Hill, and Sheehan enrolled in the music program at The New School while Kinchla attended New York University. After much encouragement by friend David Gonzales, Blues Traveler began playing gigs along the New York-area club circuit, sometimes nightly; the most prominent contract was playing Wednesday nights at a club called the Wetlands. Another bar, The Nightingale, was a regular gig, and later became the setting for the song "Defense and Desire". The group shared an apartment on Bergen Street in Brooklyn, New York, along with their high school friend, singer Chris Barron. A second band that Popper and Hill founded, called The Trucking Company, soon became The Spin Doctors with Barron as their frontman. The two groups would often share the stage, playing non-stop concerts of multiple sets. Their first show together was at a Columbia University fraternity party and their second was at a Jamaican-themed restaurant near Times Square in New York City. During this time, Blues Traveler acquired a devout follower, Gina-Z (subject of the band's song "Gina") who first became an unofficial "band mom" and later a tour manager, and is involved with the group's business to the present day. At one New York show they were discovered by an A&M Records talent scout, Patrick Clifford, and the band signed their first recording contract. By 1990 all members had dropped out of college classes. The group also attracted the attention of David Graham, son of the world-famous concert promoter Bill Graham, and became one of Graham's[clarification needed] many acts. Blues Traveler then started a relentless touring schedule, expanding their reach up and down the east coast. A second album, Travelers and Thieves, followed in 1991. Upon Bill Graham's death that year, they released a live EP, On Tour Forever, as a tribute to Graham, which featured guitarist Carlos Santana. The group was becoming well known in the new wave of jam bands that was developing in the early 1990s. The band's fourth album, titled four, was produced by the team of Michael Barbiero and Steve Thompson and released in late 1994. The upbeat pop single "Run-Around" became the group's first chart hit followed by the catchy "Hook". "Run-Around" won a Grammy Award and broke a record for most weeks on the chart. During the hiatus, Popper released a solo album with a backing band consisting of Dave Matthews Band drummer Carter Beauford and members of the group Cycomotogoat. The band made an appearance performing as themselves in the 1998 movie Blues Brothers 2000 and the 1999 independent film Wildflowers, which had been filmed a couple of years earlier. The remaining members of Blues Traveler convened and agreed that Sheehan would have wanted them to continue as a band. Auditions for a new bassist were held in concert, and included Chan Kinchla's younger brother Tad, who was unanimously determined to be the best choice for the role. Additionally, an open call was sent for a permanent keyboard player, a role of which Sheehan had often been a proponent. In January 2000, Ben Wilson of the jump blues band Big Dave & the Ultrasonics was chosen, and has since become a central contributor to the band's songwriting. In March 2012, Blues Traveler released a double-disc compilation titled 25 on Hip-O Records; the album commemorates the band's silver anniversary and includes their hit singles, new covers, and previously unreleased B-side material. It peaked at No. 49 in Canada. The following studio album, Suzie Cracks the Whip, was released on June 26 of that year. In September 2013, Blues Traveler signed with Las Vegas-based management firm, UD Factory. On April 7, 2015, the band released their twelfth studio album, Blow Up the Moon which peaked at No. 29 on Independent Albums and No. 47 on Top Rock Albums Billboard charts. As part of the album's promotion album, Blues Traveler released a music video using Rockstar editor in Grand Theft Auto V on September 14, 2015. The music video features JC Chasez and 3OH!3. In 2016, Blues Traveler made a cameo appearance in the film The Meddler. On December 7 the group released a cover version of "Go Tell It on the Mountain". In April 2017 the band announced a five-week U.S. tour to celebrate the 30th anniversary of the group's formation. In May, social posts, and a video piece on Keyboard Magazine confirmed that of the band in the studio in Nashville, TN with record producer Matt Rollings. The album Hurry Up & Hang Around was released on 12th October 2018 through BMG. ^ a b c Brown, G. (September 8, 1991). "Coloradans come running when Traveler takes stage". The Denver Post. Retrieved April 12, 2011. ^ a b c "The Spin Doctors Archive - Answers to Frequently Asked Questions About the Band Itself". www.spindoctors-archive.com. Retrieved April 12, 2011. ^ a b Jarnow, Jesse (October 18, 2001). "Our Dance With The Earth (Part I, 1987-1994)". www.jambands.com. Archived from the original on 2011-07-13. Retrieved April 12, 2011. ^ "A Nightingale Bar Reunion". www.jambands.com. November 11, 2010. Retrieved April 12, 2011. ^ a b "The Spin Doctors Archive - Answers to Questions About People & Bands in the Spin's Extended Family". www.spindoctors-archive.com. Retrieved April 12, 2011. ^ a b Ragogna, Mike (March 1, 2011). "The Patagonia Music Collective Launches -- Plus a Conversation With John Popper". The Huffington Post. Retrieved April 12, 2011. ^ "FAQ: BT Lore - Why is Gina often referred to and who is she?". www.bluestravelerforum.com. Archived from the original on July 8, 2011. Retrieved April 12, 2011. ^ "Blues Traveler | Biography & History | AllMusic". AllMusic. Retrieved 2017-10-09. ^ "Blues Traveler — Run-Around — Listen, watch, download and discover music for free at Last.fm". Last.fm. Retrieved 2017-10-09. ^ "Blues Traveler's John Popper". MTV News. Retrieved 2017-10-09. ^ "Keyboard player to join in studio". BluesTraveler.net. 2000-01-29. Retrieved 2007-03-12. ^ "Watch Blues Traveler on TV". A&E Network. Archived from the original on May 26, 2011. Retrieved April 12, 2011. ^ "Release information for Cover Yourself; Fall 2007 tour is upon us - new dates & opener information". bluestraveler.net. October 4, 2007. Retrieved April 12, 2011. ^ "CANOE - JAM! Music SoundScan Charts". Jam.canoe.ca. March 15, 2012. Archived from the original on November 21, 2008. Retrieved March 22, 2012. ^ "429 Records: Blues Traveler". Archived from the original on 2012-05-30. Retrieved 2012-04-11. ^ "Blues Traveler signs with Seth Yudof's Las Vegas-based UD Factory - Las Vegas Sun News". Lasvegassun.com. Retrieved 2015-11-02. ^ "Blues Traveler - Chart history | Billboard". www.billboard.com. Retrieved 2016-05-13. ^ Lasser, By Josh. "The Meddler Review". IGN. Retrieved 2016-05-13. ^ "Blues Traveler Announces 30th Anniversary Tour". Jambase. Retrieved 2017-07-17. ^ "Matt Rollings Produces Blues Traveler". Keyboard.com. Archived from the original on 2017-07-23. Retrieved 2017-07-17. ^ "Blues Traveler Taping Policy". bluestraveler.net. Retrieved April 12, 2011.